It has been since one month or so my husband promised me to have an Indian meal – I love Indian food, but recently I tended to have it take away at home as I am missing mates who love this spicy cuisine to join me. I was finally happy to have some Indian food on Sunday while taking my bath ritual after breakfast and before going out, hubby came to me with this face telling me some friends just called up and we were invited for lunch in a new place in Bonnevoie – ca va san dire, Italian. As a good wife, I accepted and said bye to my Indian meal – and only because new places are always exciting me a bit. 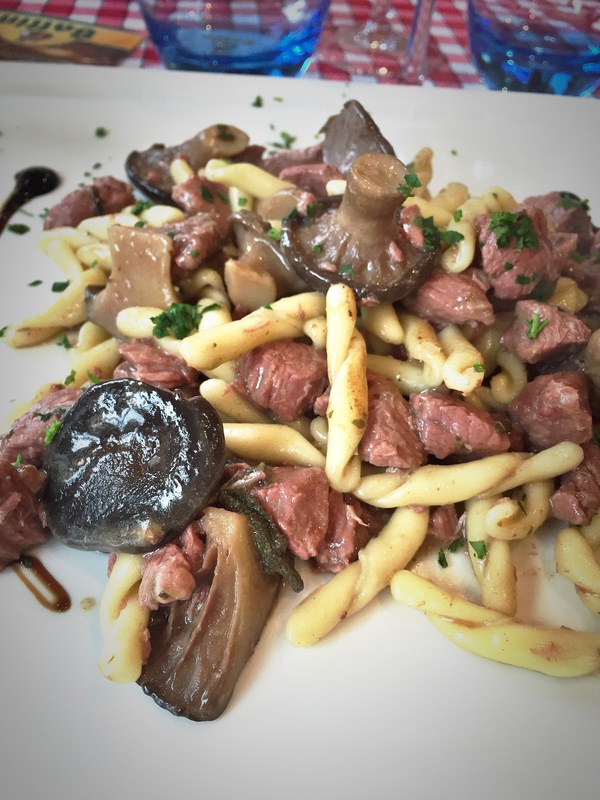 So – L’Altra Osteria is located in the premises of Bonnevoie tennis club – you have this impression to be in a remote village, while actually you are just five minutes driving from the station. The location is very typical – red and white table cloth, ham and Auricchio cheese on display, various yummy products to buy around. 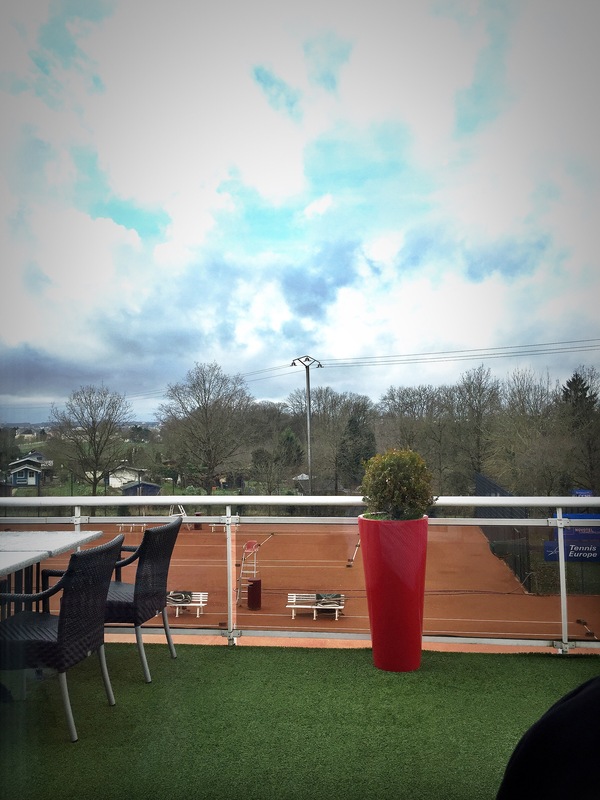 A lovely terrace – that cannot be used yesterday because of the weather – and a nice view of the countryside. 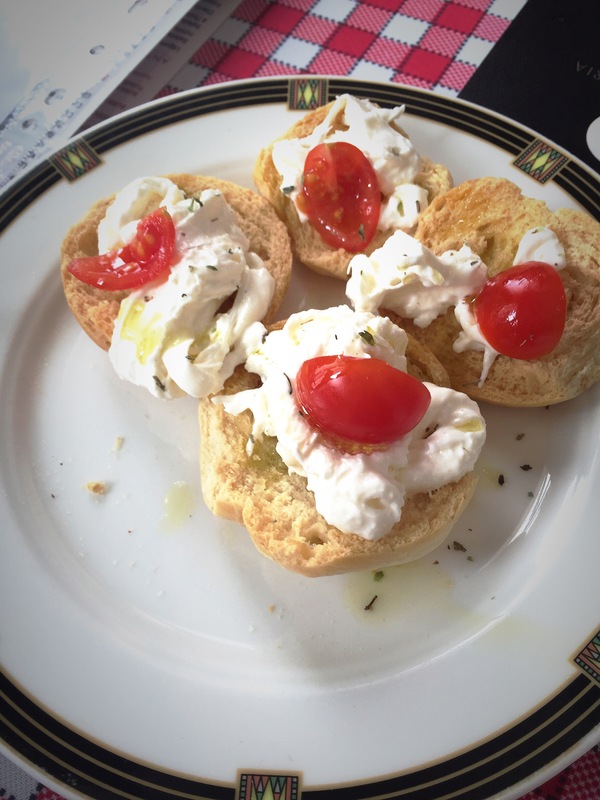 While having an aperitif – Italian alert: they have the real Camparisoda – we were served some small bruschetta with cheese. 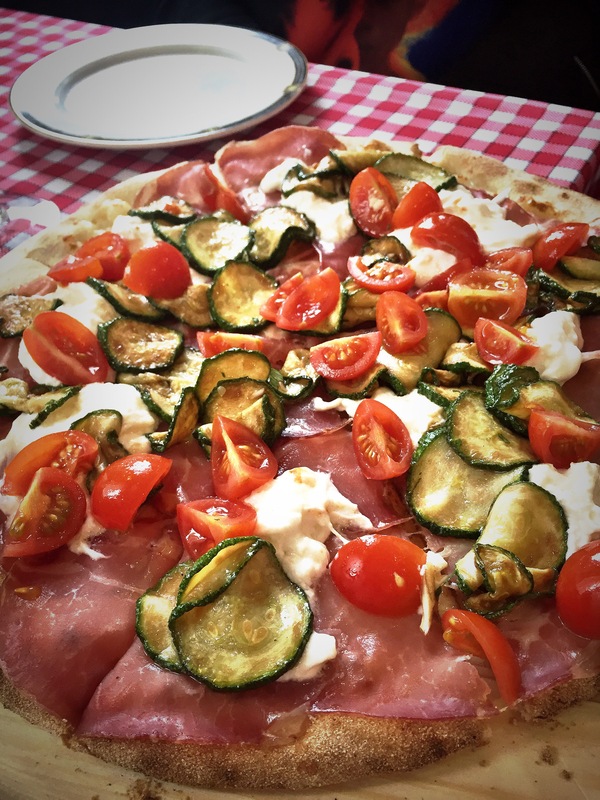 We then had a pizza to share as starter – with cherry tomato, cheese, zucchini and ham – and I ordered some pasta with mushroom and lamb meat. Find the pictures of our lunch below and, as usual, my impression of the restaurant. – Very relaxed environment: tables are very distant (you know I appreciate it! ), huge windows overlooking the city, calm area. – Great authentic food – the pizza was amazing (I will definitely go for pizza next time) and while the menu card is very classic, the weekly suggestions offer a very gourmet journey through real Italian flavors. My pasta dish was seriously to die for. – Fair prices – with 4 aperitif, two bottle of wines, one starter to share and four pasta dishes we spent 35 euro each. We had coffee and digestives offered. 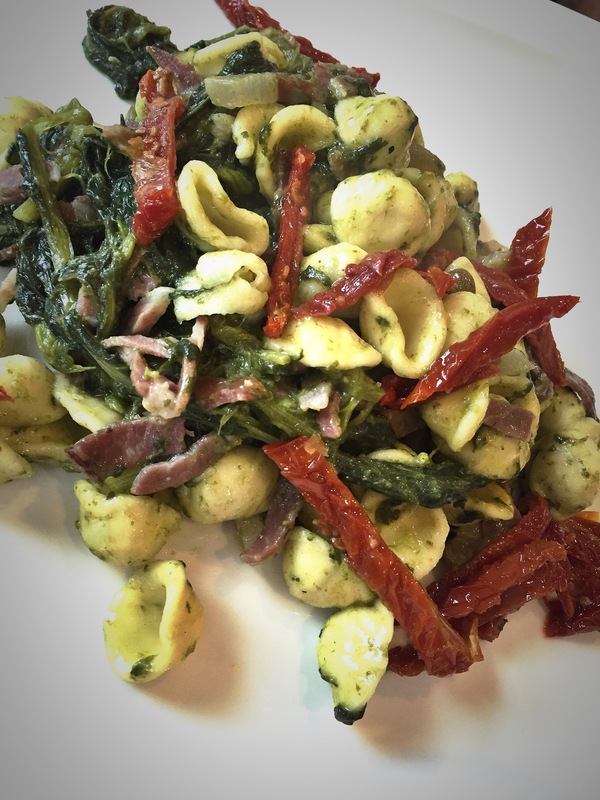 – Hubby is very picky on the pasta side and found his orecchiette too “al dente” – I had to eat them at the end while he was having the other half of my strozzapreti. His dish was less impressive than mine – in particular, the dried tomato made it quite salty. – The list of the wines is still under construction – they had only few choices of red wine, no one of them memorable. We ended up taking a Chianti 2012 that was the oldest red they had – nothing special. – This is not directly due to the restaurant, but when you access the premise you need to enter through the tennis club. The smell on the basement is incredibly disgusting and while going up to the restaurant it disappears completely, it makes the beginning of our experience very unpleasant. 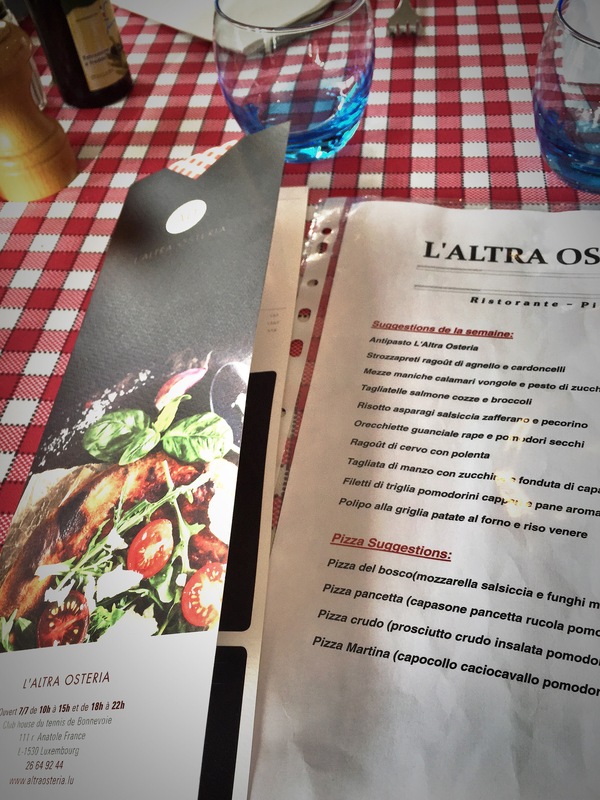 To conclude: L’Altra Osteria is a very cozy Italian restaurant located in a calm area of the city. The food is genuine and various. Some improvements might be due to the new settings, but for sure we will come back and I will highly recommend it for family gatherings and meetings with friends. Amazing pizza. It was! Indeed! Thanks for your comment!